Mercure Pattaya Hotel was recently renovated and the new additions added October 2017 have set the bar higher for all Pattaya Hotels. Upon arrival guests will see how well Mercure, marries contemporary and traditional with local and international flare. Mercure has taken guest services to the next level trying to anticipate the needs of families, business travellers, holiday makers, and even those who choose to travel with pets. The location on 2nd Road is ideal, and packed with dining options for all, and even a Cooking Class to take the cuisine of Thailand home with you. The accommodation choices are vast at this diverse Pattaya hotel. The location of Mercure is on Pattaya 2nd Road, not to far from Walking Street without being on top of it, and close to the world premier shopping at Central Festival, and away from the madness of Beach Road. Pattaya is a beach town and Mercure has brought beach right to your doorstep complete with bean bag chairs and dreamy tropical cocktails at the Pool & Aqua Bar. Maison, is also poolside, the legendary French bakery staffed with an army of Artisan bakers. There are 12 suites at the Mercure dedicated to families. They are complete with superhero themes and bunk beds with slides to reach the floor. Even on a rainy day your holiday cannot possibly be ruined when you book a Family Suite at the Mercure in Pattaya. Kids love all the options, and the hotel is also pet friendly for pets up to 10kg. Children and pets together make for a delightful atmosphere at this very family friendly hotel in Pattaya. For those that travel with their four legged companions you will be happy to know that Mercure does indeed welcome pets. This pet friendly hotel can accommodate up to two animals per room with a weight limit of 10 kg each. The pet rent is only an additional 500 baht. Bring your kids, bring your fur babies, the Mercure welcomes all at this local style resort with international level service. Once you peruse all the menus available throughout Mercure you will find that you can get almost anything without leaving the resort. The common thread among all the cuisine served is the quality is outstanding. The French bakery has a well earned reputation for their chocolate eclairs, the pastries, and the variety of tarts, and cakes that are served. The Aqua Bar at the pool serves up traditional style pizzas, gourmet burgers, and lighter fare with either Western or Indian twists. Traditional Thai food is also available, as are a number of fusion dishes and incredible cocktails served up by premier mixologists. The Mercure has 247 well appointed guest rooms, and suites available. There are 8 corner suites, 12 family suites, and 2 grand suites. The Family suites are fully supplied with entertainment for the kids, while the corner suites are spacious and luxurious with sweeping views of the Pattaya skyline and coast stretching to the mountains. The Grand Suites have left no detail unfinished right down to the corner jacuzzi bathtub big enough for two. 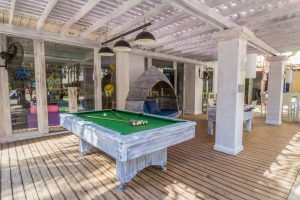 The Mercure Hotel has put a lot of love into the total renovation of the pool and entertainment area outside and set it up for entertaining families and holiday makers. It’s location is central, while not being right on the beach and is easy to get to everything Pattaya has to offer. If you never want to leave the resort it offers everything you could need on site and the staff will help you coordinate the perfect dream holiday getaway. Visit Mercure Pattaya for an international experience with local Thai flare. Come see why so many people are talking about this lovely Pattaya hotel.